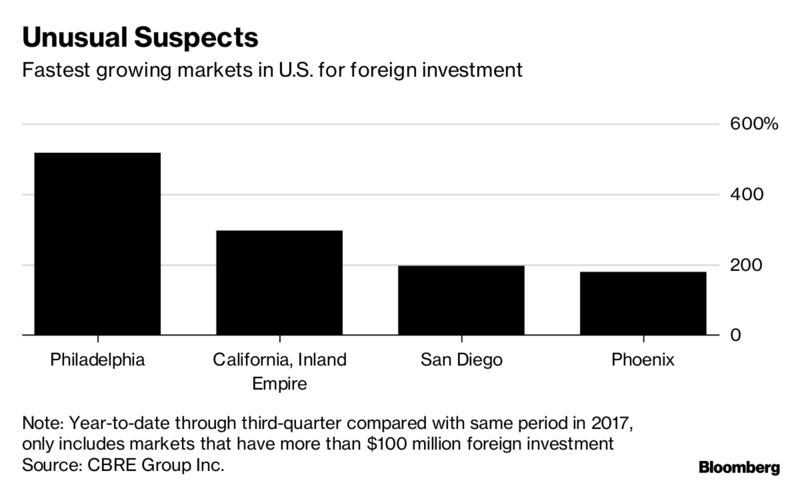 U.S. properties in places like Denver, Phoenix, Philadelphia, and the suburbs of Atlanta have all drawn foreign investment this year as buyers look for growth outside the biggest U.S. metro areas. Canadian investors topped the list of foreign buyers of U.S. real estate this year, as they have for a decade. Among those was Toronto-based Starlight Investments, which purchased apartment complexes in the suburbs of Atlanta and Phoenix through its U.S. fund. In the major markets of New York, San Francisco, Washington, Los Angeles, Chicago and Boston, commercial rents are already reaching record heights, and there’s less room to grow, so some foreign real estate investors are putting money into the next-best markets where they see yields rising. Canada, China and Germany were the top foreign investors in U.S. commercial real estate this year and are making more deals outside the biggest metro areas, according to data from CBRE. The most popular second-tier markets for foreign capital this year include Dallas, California’s Inland Empire and Philadelphia. The biggest growth was in Philadelphia, jumping 516 per cent in the first three quarters from the same period a year ago, CBRE said. Also posting big year-on-year gains were the Inland Empire, Phoenix, New York City’s boroughs, San Diego, California, Raleigh/Durham in North Carolina, and Columbus, Ohio. They were helped by stronger economic growth and local universities to supply the talent needed by investors. Starlight bought a majority stake in a 250-unit, 35.5-acre (13.6 hectare) apartment complex in the suburbs of Atlanta for US$33 million this year. The property, just minutes from an interstate highway that runs from Alabama to Virginia, includes access to a car wash, swimming pool and a dog park. 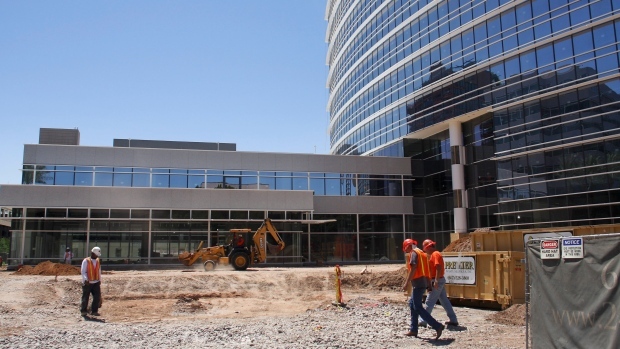 The company also acquired a 335-unit luxury apartment complex in a wealthy suburb of Phoenix. The newly completed property is fitted with a two-level fitness center, poolside cabanas and a coffee bar. “We still believe in the fundamentals of U.S. multifamily on a risk-adjusted basis: The returns are healthy and we’ve increased our number of investment vehicles,” Starlight’s Mehta said. GWL Realty Advisors Inc., the real estate unit of Canadian insurer Great-West Lifeco Inc., made its first foray into the U.S. with its acquisition of Denver-based EverWest Real Estate Partners LLC and a deal to buy Guggenheim Real Estate LLC. It’s already made more than US$400 million in acquisitions across markets including New York, San Francisco, Salt Lake City and Orange County, California. Denver ranked eighth among U.S. real estate markets to watch in a survey conducted by PwC and the Urban Land Institute, thanks to population growth that’s projected to be well above the nationwide average and a large share of residents between ages 25 and 44. Population growth in Salt Lake City is also projected to be well above the national rate, the study found. Canada’s Brookfield Asset Management Inc.’s takeover of GGP Inc. made it one of the biggest mall owners across the country, in large and small markets. A consortium of Chinese companies including the Bank of China Group Investment Ltd. and Hopu Investment Management Co. partnered to acquire Global Logistic Properties Ltd., landing a presence in markets such as Phoenix, Indianapolis and Atlanta. The bulk of foreign property investment this year still went to the major markets. 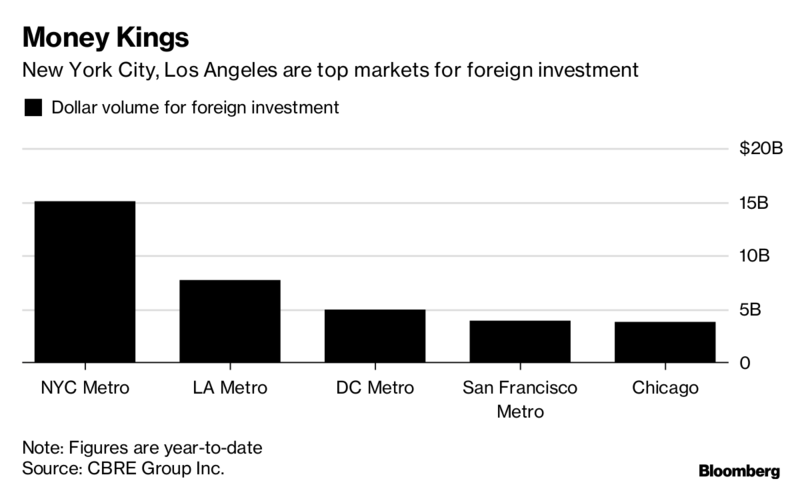 The metropolitan areas of New York and Los Angeles were the top destinations for foreign capital, reaching US$15.1 billion and US$7.7 billion so far this year. But the companies are expanding their footprint in the U.S. to capture yield in other cities as the major markets mature.